Like many in our generation I am the ultimate caretaker. I cared for my mom until she succumbed to Alzheimer's at 97. I care for my very young grandchildren, and my home resembles a bustling daycare center! For my husband Rich and I there is nothing more important than family. Then there's my father-in-law. Dad was living in independent senior housing when we began receiving 911 calls regularly advising us that he had fallen. Soon, Dad was calling us nightly to say goodbye, convinced that each night would be his last. We tried so hard to sustain Dad's need for independence. We visited often, took him shopping, brought him home for family days, and considered having him live with us. In Dad's mind, the idea of assisted living or skilled nursing was the equivalent of the death penalty. When he began taking off car doors and repositioning mailboxes, we had no choice but to take his car keys away from him. Thankfully, no one was injured. When Dad was taken to ECMC after he mistakenly took the wrong dosages of his cardiac, diabetic, and sleep medications, we were amazed at the quality of care he received. But we also didn't know what to do when we were told that Dad could no longer live alone. 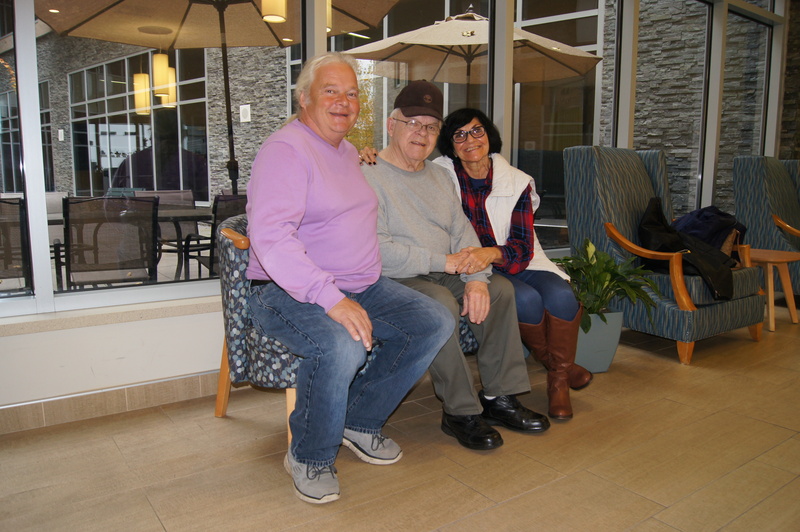 We were told of an opening at ECMC's Terrace View Skilled Nursing Facility, took the short walk over from the hospital, and were amazed at what we found. It was as if we had arrived at an upscale hotel. Terrace View's atriums were aglow with seasonal decorations, beautiful flowers and shrubs in the midst of benches, welcoming residents and guests. We knew immediately that we had found "A Place for Dad" that offered a wonderful opportunity for optimal care, compassion, and a new life. Now, two years later, Dad is truly at home at Terrace View. The staff is kind, intelligent, and my husband and I are notified of every change in his condition, doctors' orders, appointments, and medications, no matter how minor. If we have any concerns, a quick phone call to the nurses' station results in a callback with a resolution. And the view from Dad's spacious room is magnificent! Each wing is named after a Buffalo neighborhood, the hallways are well-lit, and the area is beautifully decorated with lounge areas and sofas. Dad tells us he feels comfortable, safe, and independent. His favorite daily routine is taking the elevator to the cafeteria in the lobby where he is able to socialize and eat his bacon! Terrace View provides truly compassionate care to it residents. If you have a loved one in need of a long-term care solution, visit Terrace View. It has changed our lives, exceeded our expectations, and allowed Dad to know how much we love him. To learn more about skilled nursing services, memory care, and rehabilitation for seniors and others at Terrace View call 716-551-7100 or visit www.ecmc.edu. Sheila Bernard is a retired health care professional, geriatric specialist, and CEO who has lived in WNY for more than 28 years.